Whitfield's communications director Robert Hankins said his resignation will be effective at 6 p.m. September 6. Asked for further comment on the reasons behind the resignation, Hankins offered no comment. "While I cannot comment officially with any details, as the release indicates, Congressman Whitfield will be making an announcement as to future plans within the next 30 days," Hankins said. First elected in 1994, Whitfield announced his retirement last September in the midst of a House Ethics Committee investigation regarding his wife's involvement lobbying staffers on a bill he sponsored, but he was rebuked from the unintentional violations. Gov. Bevin will call a special election to fulfill the remainder of Whitfield's term ending in January. 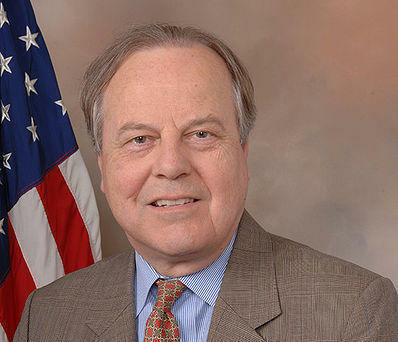 "Both personally and on behalf of the Commonwealth, I want to thank Congressman Ed Whitfield for his many years of service to our state and our nation. He has served the people of Kentucky's first district admirably, and we wish him all the very best in the years ahead," said Bevin, in a statement. "I will issue a proclamation declaring that the special election to fill this vacancy will be held on the same date and time as the General Election, which is November 8, 2016." The special election will be Nov. 8, the same day as the general election between Republican James Comer and Democrat Sam Gaskins. "I sincerely appreciate Congressman Whitfield's 22 years of service to the people of the 1st District," said Comer, in a written statement. "As his constituents, TJ and I have always admired his conservative values and steadfast support for the coal industry." With respect to the ensuing Special Election, Comer said, "I will seek the nomination for the unexpired term of Congressman Whitfield, and fully expect to be on the ballot twice on November 8, once for the unexpired term and once for the full two year term." Democratic candidate Sam Gaskins says he plans to be on the special election ballot as well. Reached for comment, he saluted Whitfield for his 20+ years in Washington. "I know that serving people is a very big responsibility and he's done it for 22 years and I have to commend him for that," Gaskins said. "It's a hard job and it's a thankless job at times." Whitfield has yet to disclose a reason for the move. In the letter, Whitfield says he will announce his future plans within the 30 days. A volunteer fire department in rural western Kentucky is getting $63,905 in federal grant money. While Democrat Sam Gaskins is running unopposed in the race to represent Kentucky's 1st Congressional District, Republican voters will choose between three candidates in the May 17 primary. 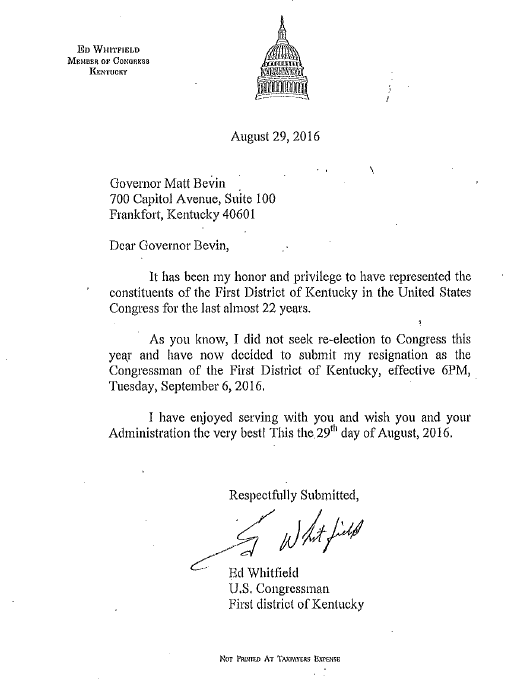 Rep. Ed Whitfield, an 11-term incumbent, is retiring. John Null spoke with those Republican candidates this week, including Hickman County Attorney Jason Batts. To hear the conversation with Whitfield's former field director, Mike Pape, click here. For former Kentucky agriculture commissioner James Comer's interview, click here. With 11-term U.S. Rep. Ed Whitfield retiring, three Republican candidates are vying for their party's nomination to represent Kentucky's 1st Congressional District - including Whitfield's longtime field director, Mike Pape. John Null spoke with Pape as part of a series of interviews with the Republican candidates ahead of the May 17 primary. Hickman County Attorney Jason Batts' interview will air Friday on WKMS. For James Comer's interview, click here. Democrat Sam Gaskins is running unopposed.